If you’re not on Twitter you probably haven’t heard of an internationally organized event taking place tomorrow night simultaneously in 175+ cities across the globe. The event is called Twestival and is being organized to bring together Twitter communities for an evening of fun and to raise money and awareness for charity: water. charity: water is a non-profit that brings clean and safe drinking water to people in developing nations. The organization has been operating since 2006, but a global community of passionate microbloggers has propelled this group to gather worldwide recognition for its efforts. Seeing how these tight-knit local communities could gather together and tackle seemingly impossible feats in a short amount of time, charity:water saw the Twitter community as an opportunity to help raise awareness to the global crisis they seek to remedy. First the idea was born, then volunteers started pouring in. Tony Scott set up Twestival.com and enabled each participating city to set up their own page. Amiando came on board to help event organizers with online RSVP tracking. Mashable partnered to promote the event worldwide. Tipjoy built widgets and organized a channel to raise donations. The sheer number of people involved in this event and the heart and passion going into all of the planning, organizing and promotion have my jaw dropped on the floor. Many times in today’s society we are plagued with thoughts of how terrible most people are and the newsrooms of the world continue to pummel us with bad news, but the truth is that good-natured people with good intentions DO exist in the world. Twestival is being organized by those people. If you’d like to become part of this monumental fundraising event, stop by http://desmoines.twestival.com (or whichever city you are from) for more information. It’s not too late to donate a few bucks and help those in need. I’ll be at Mars Cafe, 2318 University Ave tomorrow night (Thursday, February 12) and hope to see you there. 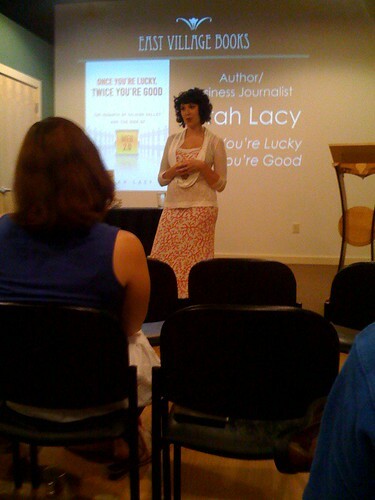 This weekend I attended a book reading event at East Village Books showcasing Silicon Valley reporter Sarah Lacy‘s first book, Once You’re Lucky, Twice You’re Good. At the event, Sarah introduced herself and gave a bit of background on herself and her 10 grueling years in the startup trenches of Silicon Valley. Sarah also highlighted her unique relationship with Mark Zuckerburg and other star entrepreneurs she had befriended over the years. The section of the book that Sarah shared was a snippet from the end of the book that talked about Evan Williams’ travels from Blogger to Odeo to Twitter and the morality of business he dealt with. Sarah answered several questions from the crowd, including a few from me regarding the impact of transparency in social media, social media as a liability for companies and leaked information and the possibilities that exist in today’s market based on the tools and platforms already available. After signing through several copies of her book (which I happily purchased and will soon be reading), the #dmtweetup crew took Sarah and her husband Geoff out for one more night on the town at the Royal Mile. Discussions carried over from EVB to the Royal Mile and everybody had a great time. For me, the best part about Sarah (and Geoff too!) was that they were both so down to Earth and welcoming. For someone who co-hosts shows for Yahoo! and spends her days rubbing shoulders with the tech elite of the country, I felt like she was very approachble and genuinely enjoyed spending time in our town. Nathan Wright of Lava Row managed to capture some great footage and scored an interview with Sarah, talking about Digg’s rumored takeover and her impressions of Des Moines.